CREWS people have been busy with various conferences this year. In April Rob was involved in organising the conference, “A Corpus and Usage-based approach to Ancient Greek: From the Archaic Period until the Koine”, in Riga, together with colleagues from the University of Leipzig University and the University of Latvia (see here). The aim was to bring together scholars working on all aspects of Greek language in the way it was actually used, rather than just focusing on an idealised presentation of the language, as has often been the case in more traditional approaches. This approach has, of course, been made possible in the last few decades with the phenomenal increase in computing power and data-storage, making large-scale corpus studies feasible that simply would not have been possible a century or even half a century ago. In his presentation, Rob used data from the parallel corpus of the Hebrew Bible and its Greek translation that he has been putting together for the CREWS project to investigate how the Greek translators dealt with the translation of a particular Hebrew verb form, the pi’el, which is often associated with an intensive meaning – e.g. šābar ‘he broke’ vs. intensive šibber ‘he shattered’, both from the root šbr. Notice that the difference in the two forms lies in the different vowels, and in the doubling of the middle consonant of the root. Since the Greek translators’ Hebrew text likely had no indication of vowel points, and double consonants would not have been represented either, the aim was to see if there was any evidence of the Greek translators could ‘see’ the intensive form. For this a method was developed in order to measure the similarity of the distribution of the translations. Although the study was preliminary, there was some evidence of the pi’el being treated differently in some verbs. However, this was not always consistent, indicating that the difference may not be due to a different systematic treatment of the verb forms, but rather of context-sensitive interpretation of the Hebrew root. Then in August, Natalia and Rob both attended the “International Colloquium on Ancient Greek Linguistics”, in Helsinki (see here), where there were two principal themes: contact between Greek and other languages, and research on original documents and manuscripts. Natalia presented a poster on “Etas in Archaic Attica? The pre-Euclidean use of <H> as a long vowel”. In this poster, she analysed four 7th century inscriptions found in Mount Hymettos with the letter eta (representing a long e sound), which is not natural to the Attic script. She compared these with later examples of the letter eta in Athens and tried to explain the appearance of this letter in the Attic inscriptions. Meanwhile Rob spoke on a method he has been developing for comparing the level of ambiguity in writing systems, applied in this case to Hebrew and Greek. The idea he was testing was that, when the Greeks borrowed the alphabet from the Phoenicians, they invented vowels, because if they had written without vowels, as the Phoenicians did, it would have been too ambiguous. Because very little vocalised Phoenician has been passed down to us, he used Hebrew as a proxy for Phoenician. Surprisingly, the results showed the opposite of what was expected, namely that Ancient Greek written without vowels was actually less ambiguous than Hebrew, suggesting that considerations beyond the merely functional was involved in the Greek development of vowel letters. Page from the Codex Vaticanus, one of the earliest surviving manuscripts of Greek translation of the Bible (the Septuagint). Now in the Vatican, image from here. Finally, in September Rob spoke at the conference, “Beyond Standards: Attic, the Koiné and Atticism”, held here at the Classics Faculty in Cambridge, and organised by our colleagues Chiara Monaco and Rob Machado. Here he spoke about the treatment of the morphology of Hebrew personal names in the Greek of the New Testament, building on previous work he has done on this topic in Jewish Greek more generally. The aim was to look at what can be said about the cultural and social relations between Greeks, Romans and Jews in first century Palestine, from whether or not an ending is put on the end of Hebrew names. It was found that most Biblical or historical figures were not morphologically adapted in this way, whereas most contemporary figures were – behaviour that is similar to that found in other Jewish Greek material of the Hellenistic and Roman periods. There were some interesting exceptions, however, where contemporary individuals were presented without case endings, suggesting an identification either with the world of the Bible, or with the non-Hellenizing section of society more generally. This is helpful context for understanding the relationships between communities of speakers in antiquity using the Greek and Latin alphabets, as well as the West Semitic abjad, and speaking Greek, Latin, Hebrew and Aramaic respectively. 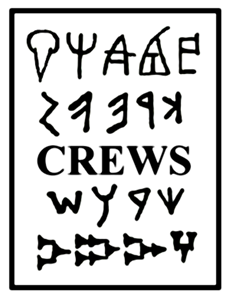 Keep an eye out here for more CREWS conference news, including two big conferences we are involved in next March – one is our own on the social and cultural contexts of writing (principally organised by Philip), and the other is the 12th AWLL workshop on the diversity of writing systems (co-organised by Rob).